Spiiderweb™: Sure Its Invasive, But Is It Also Dangerous? I've seen several articles about the backscatter x-ray technology, but have yet to see anyone discuss the possibility of the danger of too many such x-rays in any given year. I would think frequent flyers, especially ones with implanted metal, might go through such screening too often to be safe. Post-September 11, airline travel security has invoked the increased use of technology and better training of security personnel as a means of improving travel security. Some of these proposals, such as improved training for airport screeners, checking all bags for bombs, strengthening cockpit doors, and placing air marshals on flights, do not implicate privacy interests and are sound security measures. Others, however, present privacy and security risks to air travelers because they might create data files directly linked to the identity of air travelers. These files if retained could provide the basis for a database of air traveler profiles. Recently plans were announced by the Transportation Security Administration to propose the trial use of backscatter x-ray for passenger screening at several U.S. airports. 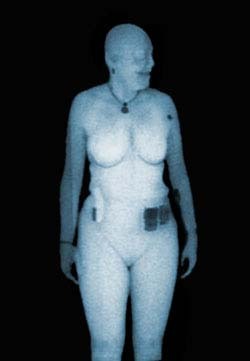 EPIC will make available on this page aviation security and privacy —related documents it obtains from the government under the Freedom of Information Act law about the adoption of "backscatter" x-ray technology intended for use in screening air travelers.